What's the one negative thing that comes with buying a new pair of shoes (apart from the depleting bank balance of course)? The blisters on our heels as we try to wear them in. It's a universal problem for girls everywhere. Well, no more! Welcolme Shulips- a brilliant little invention to prevent those unsightly cuts and scars on our heels. 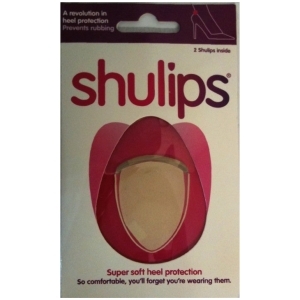 Shulips are discreet and soft petal-shaped cushions that have a tiny lip that sits over the back of your shoe. They are available in clear and black, so nobody but you and your comfortable feet will know they are there!